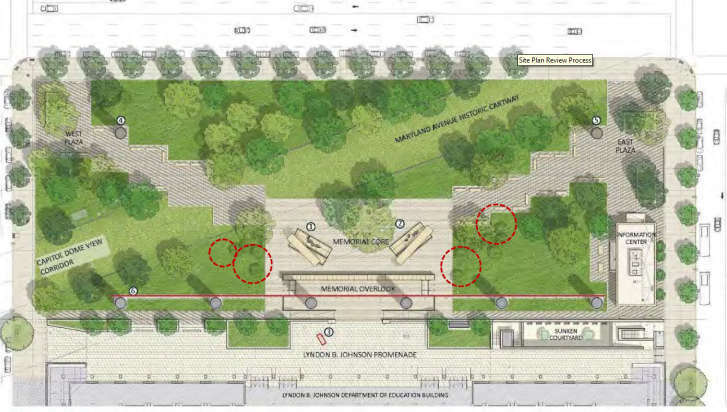 It is one of the more controversial memorials in Washington, D.C. Eighteen years after Congress approved a memorial to President Dwight D. Eisenhower, there is another change to its design. WASHINGTON — It’s one of the more controversial memorials in Washington, D.C. Eighteen years after Congress approved a memorial to President Dwight D. Eisenhower, there is another change to its design. Instead of a woven metal tapestry depicting Eisenhower’s hometown of Abilene, Kansas, Vivian Lee with the National Capital Planning Commission informed the board Thursday that the new design reflects an aerial image of the beaches of Normandy, France. The scene features Omaha and Utah Beaches, site of D-Day, the Allied invasion of Europe that took place on June 6, 1944 and solidified Eisenhower’s heroic legacy. The previous tapestry design was approved in July 2015. The change in image is one of three revised concept and design changes the board approved Thursday. There are still two more phases to go, which include time for public comment. Four trees will need to be removed to improve the sight lines to the beach scene pictured at peace, which becomes more transparent as it approaches the sky. The third change is necessary, Lee said, because of the first. She explained that since the tapestry no longer symbolizes the former president’s Midwestern roots, the statue of him as a young man looking out toward his future no longer makes sense. “Since the image of the tapestry will be revised, the symbolic connection is no longer relevant,” Lee told the commission. The Eisenhower Commission envisions the statue, which is no longer standing but seated, placed outside the memorial on the promenade dedicated to President Lyndon B. Johnson. But not all agree with the change. “We were told that statue is essential. Now, it is hidden behind the tapestry as if to say pay no attention to the boy behind curtain,” Justin Shubow told the commission. Shubow represented the National Civic Art Society in telling the Commission it does not approve of a beach scene or the relocation of the Young Ike statue onto the LBJ promenade. “The new tapestry image is banal and bland. It’s a work of geography not art,” he said. “The aesthetics as art is not really before us. It’s how that imagery impacts other buildings is something that is before us,” said executive director of the commission Preston Bryant. The Commission approved the revised concept design and will vote on two more phases. In 2014, the U.S. Commission of Fine Arts voted to approve the monument’s design by contemporary architect Frank Gehry. Before that, many were critical of Gehry’s design. Tom Bethell of the American Spectator called the design a “monstrosity.” David Brooks of The New York Times wrote that the proposed design emphasized moment’s of innocent boyhood instead of Eisenhower’s moments of power. Eisenhower’s relatives were unsupportive of Gehry’s design but after negotiations that involved Former Secretary of State James Baker, The Eisenshower Memorial Commission announced in September 2016 that they now support it.